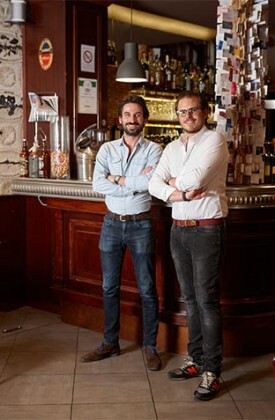 It is a few step from the rue de Lévis, in the seventeenth arrondissement, that Victor and Julian, two childhood friends in their thirties, have taken over Chez Léon. Do not look for an industrial decor, rough stone or artistic photos. Here, the traditional ambience is set with beautiful woodwork, such as the large counter. Because Chez Léon, what counts is in the plate. And this one is generous and greedy. Octopus carpaccio, homemade duck terrine, bottarga board, as entrées before having to choose between a delicious – and invigorating – crispy suckling pig or one of the three daily specials, which change daily. A welcoming address that could quickly become a canteen of choice. B.D.